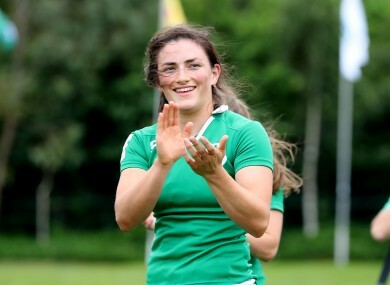 IRELAND WILL FACE Tunisia in the Championship Cup quarter-final of the Women’s Global Sevens Qualification Tournament, after they secured a hard-earned victory against China in their final Pool C encounter today. Following China’s commanding successes over Portugal and Trinidad & Tobago, it was expected that Ireland would be facing into their toughest game of the competition to date. However, the tournament hosts played with a tremendous tempo during the early exchanges, and at the end of a sweeping move across the Chinese line three minutes in, Amee Leigh Murphy-Crowe squeezed through on the right-flank for the opening score of the tie. Murphy-Crowe has been one of the brightest performers for Ireland in the pool stages, and thanks to incisive attacking play from Lucy Mulhall and Stacey Flood, she was allowed to race through underneath the posts moments later. Mulhall added a routine conversion to this five-pointer, and this meant that Ireland ended the opening half with a promising 12-0 advantage. The pressure was now on China to respond to Ireland’s first-half surges, but with replacements Niamh Briggs and Alison Miller adding a calming influence, Anthony Eddy’s Green Army controlled the tempo of the play. Although they couldn’t capitalise on the pressure they applied inside the Chinese ’22’, they safely sealed top-spot over their opponents in comfortable style. They can now look forward to an 11.50am clash with Pool B runners-up Tunisia tomorrow, but with a total of 164 points scored (and 0 conceded), Pool A winners Russia were undoubtedly the standout team on Day One of the competition. IRELAND: Megan Williams, Ashleigh Baxter, Kim Flood, Stacey Flood, Amee Leigh Murphy-Crowe, Aoife Doyle, Lucy Mulhall (Captain). Replacements: Audrey O’Flynn, Niamh Briggs, Nicole Cronin, Louise Galvin, Alison Miller. CHINA: Yang Min, Shen Leilei, Zhang Wanting, Chen Keyi (Captain), Gu Yaoyao, Liu Xiaoqian, Liu Yan. Replacements: Guan Qishi, Zhou Rong, Yang Hong, Yan Meiling, Ling Chen. Email “Ireland women's sevens side set up showdown with Tunisia”. Feedback on “Ireland women's sevens side set up showdown with Tunisia”.